GuildWorks originally started within the Kite Industry based on tensegrity and architectural principles. By applying aerodynamics knowledge, GuildWorks, developed and patented the “Tension Suspended Airfoil”. 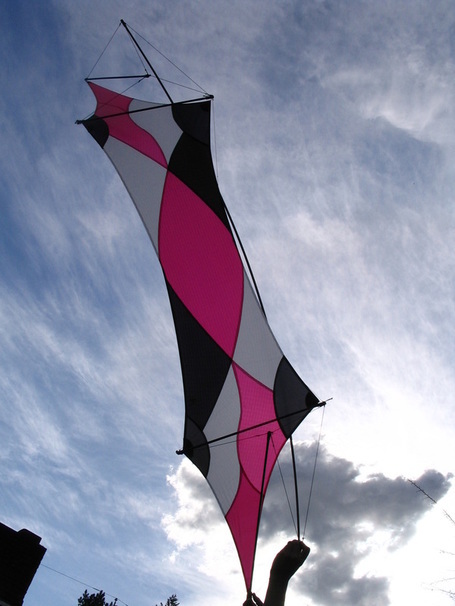 GuildWorks released the Synergetic Series kites in the beginning of 1994. Immediately recognized for their innovation, they were awarded the “Best New Kite” from the Kite Trade Association, and “Best Multi-Line Kite” from the Smithsonian Institute. Soon after GuildWorks released released the first three line kite, the Synergy 333, on the market. For many years GuildWorks transformed the kite world through innovative design. The images here include the Synergy Deca 15, a 15 panel version of the Synergy Deca that was known for it's smooth performance while giving faster response and more radical tricks. ​The Synergy Deca 6 is more all around stable kite out of the series and was designed for the entry to advanced level flyer. The Zero Wind Great Deca below, is the most sophisticated indoor kite performance kite, and has been featured and utilized all over the world including places like Walt Disney World and the Epcot Center to just name a couple.